Although I played NBA Live 2002 a lot when it came out, resulting in a Franchise experience that I finally found closure on many years later, I wouldn’t rank it as one of the best games in the NBA Live series, nor one of my absolute favourites. As I mentioned in my retrospective, the game does hold up somewhat better than I remembered, but with some of its issues, it’s tough to go back and spend a lot of time with it now. And yet, I strangely do feel quite nostalgic for NBA Live 2002. A big part of that is the fact that I did make the most of the game back then and had a memorable Franchise experience along the way, but there’s more to it than that. NBA Live 2002 was the new game that came out shortly after I took over here at the NLSC. I was entering my final year of high school, and while I certainly don’t yearn for that time, looking back now, I can recognise it as an important stage in my life. There was the weirdness of seeing Michael Jordan in a Washington Wizards uniform, and actually having him as an active player in NBA Live. New stars were emerging; it was definitely a time of change all around. 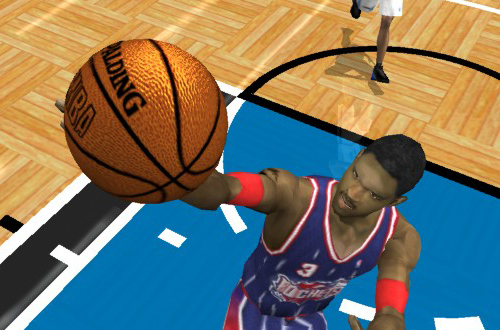 Somehow, NBA Live 2002 encapsulates that period of my life and everything that was going on, so regardless of its quality – and a song I used to hate but have come to kind of like – it’s oddly special to me. Do I like Michael Jordan in Flight simply because Michael Jordan is my all-time favourite player, and this is one of the basketball games from the 90s that he actually appears in? As I said in my Wayback Wednesday feature: most likely, yes. On top of that however, the concept of a 3-on-3 tournament with fictional players (plus MJ) is an interesting one. It’s also rather unique, being a PC exclusive release that utilises the mouse for player control. Other PC basketball games have offered the mouse as a controller option, including the early NBA Live titles, but it was rarely the default or preferred device. It’s also rare to see a PC-exclusive hoops title to begin with. This was a game that I’d heard about and seen in stores, but I didn’t actually pick it up until it had been out for a few years. At that point, its graphics still held up quite well, and the replay editing feature – uncommon at the time – was certainly impressive. It’s playable despite its unusual controls, and it is still fun to revisit on occasion. Even back then though, I preferred playing a game like NBA Live 96, or NBA Jam Tournament Edition. 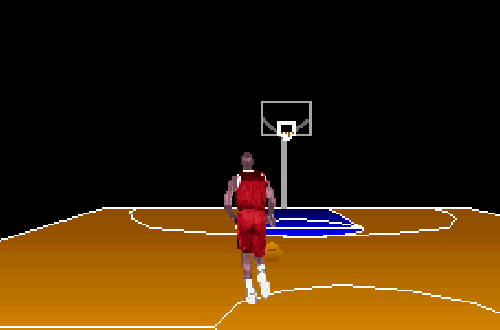 It’s an appreciation for the sophistication of the graphics despite being an early 3D title, the novelty of the basic concept and features such as replay editing, and the presence of His Airness, that account for my nostalgia here. I still feel that NBA Live 99 is an underrated game. Going back to what I said in my retrospective, it has the misfortune of coming between basketball games that are considered a huge step forward (NBA Live 98) and one of the best overall releases (NBA Live 2000) in the NBA Live series. It’s also infamous as one of the few basketball games to be affected by a lockout, shipping with final 1998 season rosters as a result. Nevertheless, it’s still a great game in its own right, with features and improvements that stand as a pleasing step between 98 and 2000. The odd thing about my nostalgia here is that I didn’t actually play NBA Live 99 all that much at the time. However, it’s fair to say that I wish that I had played a bit more of it when it was new, which is partly why it sticks in my mind. Beyond that, the fact that it is a bit underrated, and such an oddity due to the consequences of the lockout, is a big part of the charm for me. I also really like NBA Live 99’s soundtrack, menus, and general atmosphere. The official patches added 1999 season rosters, which are memorable because of all the players that changed teams in a flurry, as the league began transitioning into a new era. I’m fairly certain that it’s also the last NBA Live game from the 90s that I made a current roster update for, a few years after it was released. On paper, there’s no way that NBA Live 2003 should make this list. I’ve gone on record several times talking about how I disliked the “Courtside Comedy” cutscenes. The game also left much to be desired for those of us who wanted a more realistically-paced, sim-oriented experience. I’m a bit puzzled when I see some people call it the best game in the series, and rank it ahead of releases such as the PC versions of NBA Live 2005 and NBA Live 06, or its immediate successor, NBA Live 2004. At the same time, I can understand the appeal, and since I am including it on this list, it’s obviously a game that I myself also have a certain nostalgic appreciation for. First of all, it’s an important release because of the introduction of Freestyle Control, which revolutionised player control and dribbling mechanics. Second, like NBA Live 2002 the year before, it came along at a significant time in my life, so I’ve come to associate it with memories of that era. It’s another game with a great soundtrack, it was set in MJ’s final season, and with the addition of CustomArt, the modding community really blew up. I also did play NBA Live 2003 a lot, making the most of it despite the fact the gameplay wasn’t quite what I wanted. It’s significant in its own right for Freestyle Control, but for a variety reasons, it’s also special to me personally. Until the NBA Live 16 event in 2015, the NBA Live 09 community event in 2008 was the last one that I attended. Playing the Xbox 360 version at the event, I remember thinking “Man, I wish we were getting a PC port!” Specifically, I recall being impressed by the different shot arcs, the new NBA Live Academy, and the inclusion of more FIBA teams. The new partnership with Synergy Sports was also promising, and the “made fresh daily” previews on the official website were a lot of fun to check out every day. 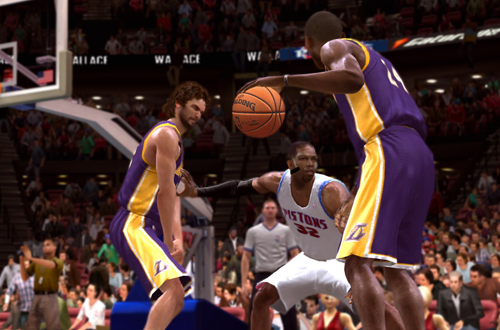 Naturally, it feels dated now, but at the time, NBA Live 09 felt like a step in the right direction after a rough couple of years for the series. Also, as much as I feel that the PlayStation 2 version of NBA Live 09 was a subpar product, I would have preferred a PC port of it over having no PC version at all. I’m also kind of fascinated by the PS2 version. Despite being an afterthought, and the final NBA Live game on PS2, there was some effort put into it. It has a full single season career mode, which the PS3/360 version lacks. It has a variation of hot and cold streaks, even though it wasn’t powered by the Synergy updates. 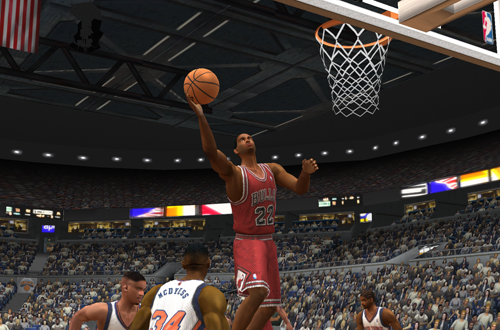 From the innovative aspects of the game itself, to the way the previews were handled, I have fond memories of NBA Live 09, even though it’s not one of my all-time favourites. When it comes to the basketball games that you’re nostalgic for, do you have any unusual choices? Let me know in the comments section below, and as always, feel free to take the discussion to the NLSC Forum! That’s all for this week, so thanks for checking in, have a great weekend, and please join me again next Friday for another Five.